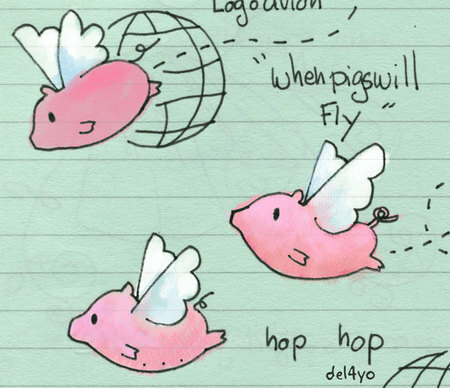 When pigs fly...Is it the correct expression? Please tell me. I've been told that if you do six amazing things before breakfast then pigs will fly. It sounds very amazing indeed. But I remembered that I'm not able to do much before breakfast because I'm so hungry and maybe that's the reason why I never saw pigs flying. I've also been told that a little friend of mine is now reading my blog, I feel very honoured and I say "hello!" to her (yes Em' it's you) and to all the little girls who read my blog too. L'equivalent Anglais de l'expression " quand les poules auront des dents" est a peu pres "
quand les cochons voleront". J'aime beaucoup cette expression, et j'ai appris que c'est sense arriver quand on est capable de faire six choses impossibles avant le petit dejeuner. Cela me parait beaucoup, surtout que je suis incapable de faire quoique ce soit d'impossible ou pas quand j'ai faim. Je fait un petit coucou en passant a mes lectrices Francophones de moins de 10 ans...Comme ca , pour le plaisir.